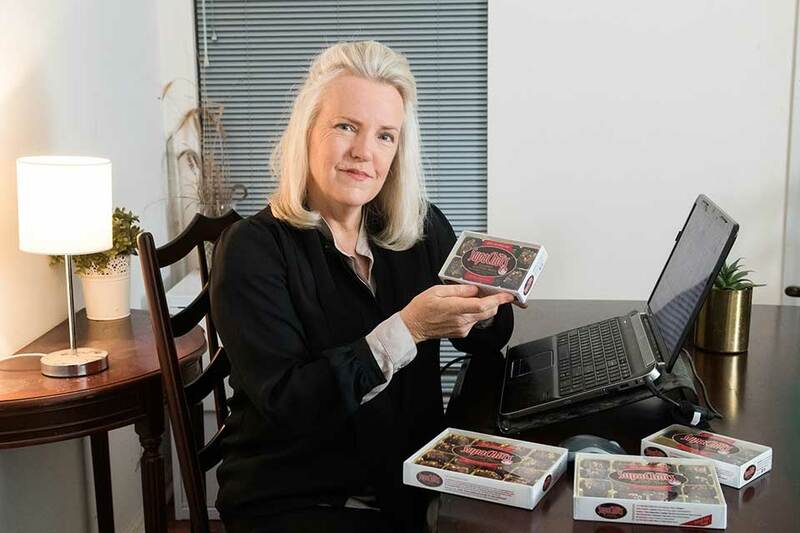 As well as SupaChocs being available at selected Foodland stores and our Blackwood and North Adelaide Nutrition Clinics you can now also purchase SupaChocs online and have them delivered straight to your door or business in SA. For more information on our products, and the Online-Order options available, please click here. For more information on how to place an online order and/or for details on deliveries, please click on the link below. Choose the order option that best suits you then add it to ‘your shopping cart’. If you want to add or remove items, you can do so from this page. FREIGHT:. Shipping/ Delivery is $14.00 to anywhere in SA, for each of the 6 Order Options available and this will be added to your order. If you live outside of SA and wish to place an order please contact us to discuss this option further. Our secure online payment system uses the PayPal payment gateway. When you wish to finalise your order, click on the ‘checkout’ button and add your payment, address and delivery address. Finally, Click on the ‘Pay Now’ button. After you have completed your purchase you will receive an email with your order confirmation and a receipt with your order details from Caron Milham and Associates. If you have any difficulties or there is an error with your order please contact us between 9 to 5pm. *Adelaide Metropolitan: If your order is placed before 1pm* your order is despatched the morning of the following business day. So if your order is placed on a Monday, Tuesday, Wednesday or Thursday your order is despatched the next day. Note: Orders placed on a Friday before 1pm will be despatched on the next business day which is a Monday. **Adelaide outer metropolitan: Orders placed before 1pm on a Monday or Tuesday will be despatched the next day. Orders placed after 1pm Tuesday will be despatched the following Monday. ***Regional and Rural SA: Orders placed before 1pm on a Friday will be despatched the following Monday. All deliveries are made by a registered courier. Deliveries within metropolitan SA: Your order will arrive before 5pm, on the same day that your order is despatched. So, if you order before 1pm today you will receive your order by 5pm tomorrow. This applies for orders placed before 1pm on a Monday, Tuesday, Wednesday and Thursday. Orders placed after 1pm Thursday will be despatched on the following Monday. Deliveries outside of the metropolitan area: Your order will arrive between 1 to 2 days after despatch. So if you order by Monday 1pm, you will receive your order by Wednesday 5pm. If you order by Tuesday 1pm you will receive your order by Thursday 5pm and if you order by Wednesday 1pm you will receive your order by Friday 5pm.If you order later than 1pm on a Wednesday your order will be despatched the following Monday and will arrive by Tuesday 5pm. Deliveries to Regional/ rural areas: Your order will arrive between 2 to 4 days after despatch. So if you order by 1pm Friday this week, your order will be despatched the next Monday morning and your delivery will arrive between Wednesday and Friday 5pm that week. For more information about the status of your order, please feel free to call us on 08 83586636 or email us. Our online shop is open during normal business hours 8.30am -5.00pm AEST Monday to Friday. We will remain closed on all South Australian Public Holidays. Any orders placed after hours, the weekend or public holidays or after 1pm on a weekday will be processed the next business day. Despatch is always at least the next business day after your order is received to ensure minimum transit time. Stock shortages. Please note, in the case of stock shortages, there may be a slight delay on your order. If this delay is expected to be more than 3 days, we will instead contact you to offer an alternative product (up to the same value) or offer a partial refund. Our staff will endeavour to process all orders as quickly as possible however please keep in mind there may be some fluctuations in demand, which may have an impact on processing times. All of our products are fresh, delicious and top of range. During extreme heat however, to maintain the high quality of our product, we will need to place a hold on your order and will contact you by email when it is appropriate to dispatch it. Should there be any issues with your order, please call us on 08 83586636 between the hours of 9 am and 5pm Monday to Friday or email us. If you are not available to accept the delivery during business hours, a card will be left for you to have your package redelivered at another time or another alternative option you can choose. A phone number will be on the card that you can phone to arrange your preference. Please note that if you choose to have your package left, this option will be at your own risk as we will not be liable for any loss or damage. We recommend that you provide us a work address or similar, where someone will be available to accept the parcel. Post Box addresses are not acceptable. In the unlikely event of your goods being lost or damaged in transit, please call us within 14 days of placing your order to enable us to assist you. As a Dietitian with an interest in exquisite food (not to mention a degree in Organic Chemistry) I have been passionate about creating tasty treats that enhance our health. I designed SupaChocs for Chocolate lovers and firstly for myself (always been a chocolate lover! ), friends and family. I created them with 7 selected nuts and seeds and 4 fruits then blended and infused them with premium cocoa and other natural ingredients in a special way. With a 4 ½ health star rating and loaded with flavour, protein, fibre and abundant nutrition they make you feel good, fill you up and give you lasting energy. I want to now make SupaChocs available to others including my clients with Diabetes, high cholesterol or who are watching their weight. Taste and health meet with SupaChocs so now you can… Have ‘your chocolate’ and eat it too, every day. 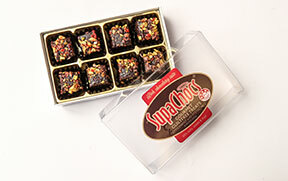 SupaChocs contain around 90% nuts, seeds and dried fruit and are an exquisite tasting, super healthy product! They are ideal if you are looking for a higher protein, nutritious chocolate alternative that isn’t a dry or crunchy nut or muesli bar, but SupaChocs are also suitable for people with Diabetes, high cholesterol or if you are watching your weight. Not only that, they also happen to be gluten, peanut and dairy free and vegetarian so they ‘tick a lot of boxes’ and can suit people with many different dietary requirements. 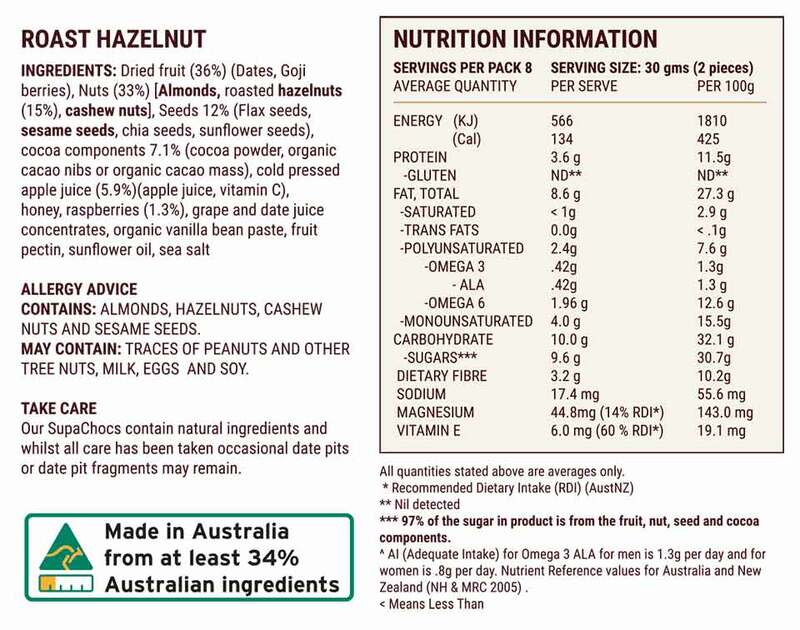 Have 4 ½ Health Stars and only 3% saturated fat which is around 90% less saturated fat than chocolate! Fibre and protein are both above 10%, in fact protein is 12%! Over 97% of the natural ‘sugars’ in the product are from the fruit, nut, seed and cocoa components , not from added sugar or syrups like rice or maple syrup or coconut sugar. Contain as well, 3 different nuts and 4 different seeds including the commonly called ‘Superfoods’ - chia and flax seeds, almonds, walnuts and goji berries, so they pack a nutritional punch. They contain over 32% of the adequate intake of Omega 3’s and are a good source of Vitamin E, in fact over 57% of your daily E ANTIOXIDANTS. …They are also a source of Fibre, magnesium and healthy fats and have a low proportion of saturated and trans fats of the total fat content! There are NO ARTIFICIAL Colours, flavours or preservatives. And they also happen to be GLUTEN FREE, DAIRY FREE AND VEGETARIAN FRIENDLY. Follow us on Instagram to find out about our new developments/products! Two size boxes are available of each flavour 120g (8 Piece pack) and 240g (16 Piece pack). 8 Piece packs (8 packs) are available at Selected Supermarkets. Both 8 and 16 Piece packs (16 packs) are available at our Nutrition clinics and our online store. Please note deliveries are to residents in South Australia only. 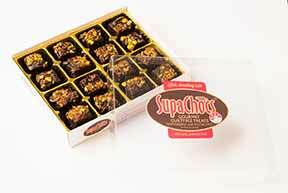 SupaChocs is a competitively priced premium product with high quality ingredients and great nutritional value. An 8 Piece Pack is $14.90 and a Pack of 16 is $24.90. ‘16 Packs’ of each flavour can be ordered as a single pack (or more). Alternatively, you can order a box of 3 packs –called a ‘Mixed’ box (where you will receive 2 packs of 1 flavour and 1 pack of the other flavour). 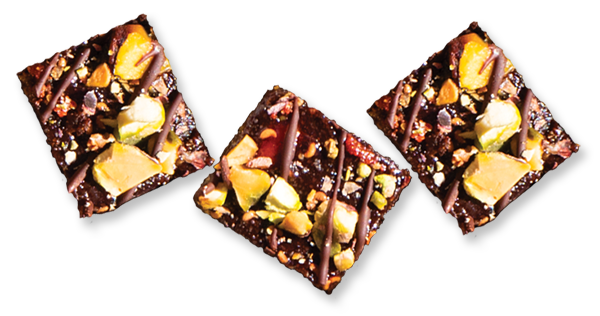 If you would like to retail SupaChocs from your store/café/outlet, please contact Caron Milham to discuss further…. Please see answers to common questions below. These answers are by Caron Milham. Dietitian. If you have any other queries please contact us with your questions. I am Diabetic, can I eat these? In most cases, Yes. SupaChocs contain 46% nuts and seeds and 36% fruit. They are over 10% fibre and protein and they achieve a rating of 4 ½ health stars.2 pieces or 1 serve contains 135 calories, 10 grams of carbohydrate, 3.6 grams of protein and 3 grams of fibre. If you are consulting with a dietitian then please advise her/ him about this composition so that they can be integrated into your program. My blood cholesterol is high. Am I able to eat these? Yes. There is a low proportion of saturated and trans fats of the total fat content. Saturated fat is only 3%. They are a source of healthy fats – monounsaturated and polyunsaturated fats. I am trying to lose weight. Can I eat these? Yes. 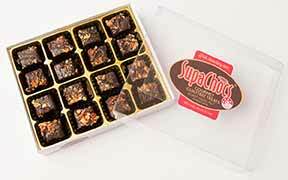 SupaChocs have a rich, full bodied flavour. They give you an intense chocolate experience but with the protein and fibre of all the healthy ingredients. Many people say that they satisfy without needing to overeat them – one or two are often enough. They contain a nice combination of protein, carbohydrates, fibre and healthy fats that keep your satiety and energy levels high. Many of my clients include these on their weight loss programs and have 2 a day as a snack. I have food allergies. Are they suitable for me? 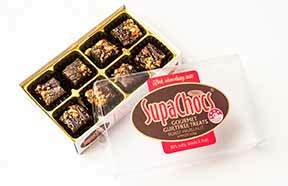 SupaChocs contain almonds, walnuts, hazelnuts, cashew nuts, and pistachio nuts and sesame seeds. 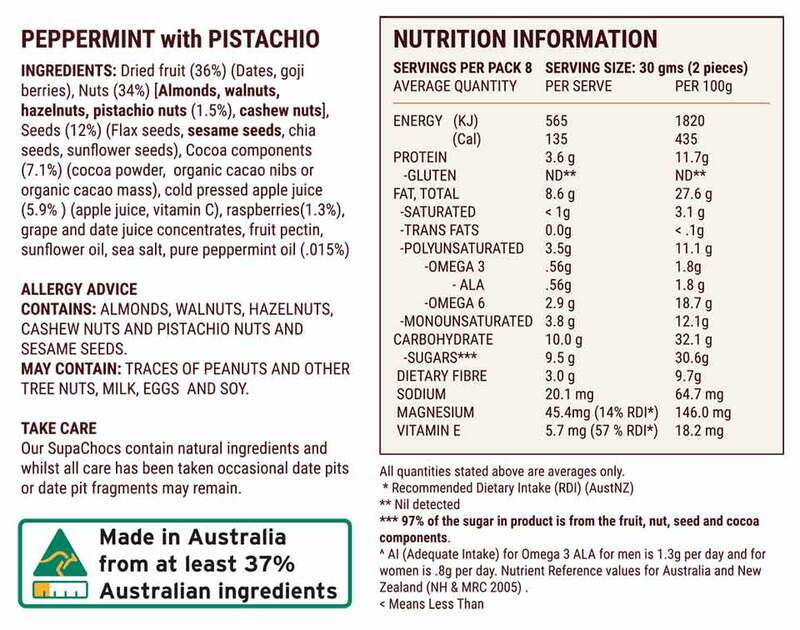 They may also contain traces of peanuts and other tree nuts, milk, eggs and soy. If you have allergies to any of these foods it is best however if you do not consume them. Do they have to be kept in the fridge? SupaChocs maintain maximum shelf life and flavour in the fridge in their sealed packaging or in an airtight container. They can be stored in the fridge for 4 weeks. If you have purchased them from the Supermarket they will have a ‘best before’ date on them and this assumes you will be storing them in the fridge. If they spend a few days outside of the fridge during this time though that is fine. For maximum enjoyment however, eat your SupaChocs when they are cold as then you get more of a ‘melt in the mouth sensation’, when you go from fridge to mouth.